Klaske Havik is a versatile writer. Though most readers might be more familiar with her work as a contributing editor to the architecture journal OASE and contributions to critical volumes on architecture, her poems and prose have appeared in important literary journals in the Dutch-speaking region such as DW B and De Revisor. Havik does not treat these different modes of writing as segregated fields, but seeks to connect them. Both her academic and literary work is characterized by the desire to explore the intersections between architecture and literature; in so doing she assesses the potentials of literature as an architectural device, and equally, architecture as a literary device. An example of the latter can be found in her correspondence with writer and artist Maria Barnas entitled Analoge Ruimtes [Analogue Spaces], which appeared in DW B in 2012, and can be best described as a joint tentative effort to construct a written architectural “space” on the pages of the journal. 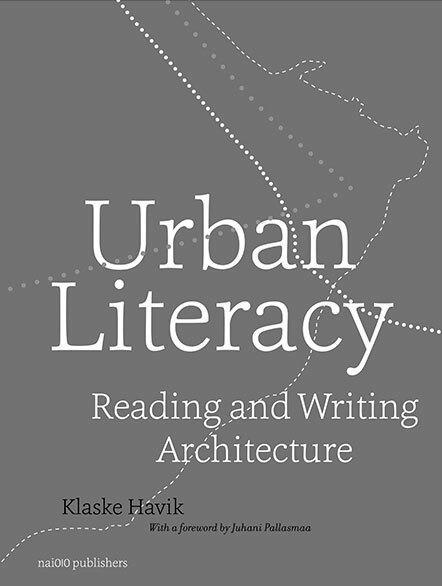 In terms of writing Urban Literacy also encompasses seemingly all registers of Havik’s practice. In the three key sections the chapters that revolve around literary analysis alternate with chapters that “read” architectural case-studies. A fourth more didactic section aims to chart the possible practical implementations of the ideas developed in the theoretical content. Remarkably, the book opens and closes with a short literary text, which beautifully illustrates the main point of the book: that literature offers a “richer perspective from which to address the complexity of lived experience,” and can evoke “another way of thinking about architecture and the city.” The prologue is a poetic rendering of the writer’s own encounter in 2006 with architect Jože Plečnik’s Triple Bridge in Ljubljana, Slovenia. Musing on the bridge, Havik suddenly realises that it is the perfect “metaphorical model” for her own research “apparatus,” which differentiates three “scriptive” modes that structure the theoretical components of Urban Literacy: description, transcription and prescription. In the epilogue Havik projects herself onto Plečnik’s mind, which results in an evocative (yet at certain moments perhaps somewhat pompous), fictitious account of the architect’s vision for the Slovenian capital. As the themes developed in Urban Literacy are practically absent from existing architectural discourse, Havik has no predefined methodological toolkit at her disposal. She relies heavily on theories developed within the phenomenological tradition in architecture theory. This is illustrated by the fact that the book features proof of the support of the two main heirs of this tradition: Juhani Pallasmaa, who wrote the foreword, and Alberto Pérez-Gómez, whose recommendation appears on the book’s jacket. In his foreword Pallasmaa stresses that architectural experiences are by nature “multisensory, embodied and existential.” In the modern era, however, architectural design has been self-evidently regarded as a discipline of the eye. This “retinal bias,” as Pallasmaa calls it, was established at the expense of a real phenomenological experience of the architecture that surrounds us. Architects and theorists affiliated with phenomenology are typically interested in the direct and bodily experience of the built environment – the tactility of building materials, the sensory properties of a space, etc. Writing of course implies a certain distance and abstraction; it can at best represent or mimic or perhaps evoke “lived experiences.” This tension is partly resolved in Urban Literacy through Havik’s argument that we, as readers, co-constitute the descriptions of spaces and places we encounter in literature, which we imbue with our own experiences, memories and aspirations. Moreover, Havik argues that architecture, like writing, is born in the imagination: both originate from a speculative moment. A design is per definition invested with a measure of virtuality – with fiction – as it is conceptualised, imaged and imagined through drawings, plans, models or texts. The entire pantheon of phenomenology seems up for discussion in Urban Literacy: philosophers such as Martin Heidegger, Maurice Merleau-Ponty and Gaston Bachelard as well as architects and theorists such as Christian Norberg-Schulz, Juhani Pallasmaa, Alberto Pérez-Gómez and Steven Holl. It is to the merit of Havik’s book that it does not discuss this tradition in isolation, but that its main figures are placed in a dialogue with a vast gamut of writers, theoreticians, and architects, including Walter Benjamin, Guy Debord, Richard Sennett, Yi-Fu Tuan, Gilles Deleuze, Italo Calvino, Georges Perec, Mark Z. Danielewski, Aldo Rossi, Aldo van Eyck, Peter Eisenman and Bernard Tschumi. This polyphony is one of the book’s main charms. It is, however, also its chief weakness. For instance I find it quite bewildering to find that Charles Landry – who coined the term “urban literacy” – and Henri Lefebvre are quoted on the same page, without any reference to the fact that they are, at least on first sight, ideologically poles apart. Landry, best known for his policy-friendly book The Creative City: A Toolkit for Urban Innovators (2000), is one of the main proponents of the creative city / creative class paradigm, which still reverberates in the planning departments of many city halls today. The neoliberal undercurrent in his work (and that of his fellow creativity prophet Richard Florida, who is also cited in Havik’s book) has often been identified and attacked. Lefebvre, by contrast, was a Marxist thinker, whose notion of the “right to the city” is ironically habitually reiterated by critics of the very neoliberal urbanisms (gentrification, city branding) often associated with Landry and Florida. I am not ruling out the possibility that there is a hidden synergy or kinship between the theories of urban development proposed by these opposite minds, but in Havik’s discussion these problems are simply left unmentioned. Ethical, political or philosophical differences between some of the protagonists could have been fleshed out more convincingly. A montage of quotations can be, I believe, truly productive when it acknowledges the ideological soil from which the selected statements arose. It should be made clear, however, that Urban Literacy’s many merits easily outweigh its occasional lack of accuracy. I am convinced that Havik’s evocative and accessible book will be an important source to anyone interested in “reading” or “writing” architecture – architects, students and scholars of (the history of) literature and architecture, and writers alike.